Silicon Valley-based Dado Banatao pointed out what he thinks are the key weaknesses that make Pinoy entrepreneurs less competitive in the global business landscape. He calls on the education and public sectors to help hone ’technopreneurs’ for the future. “Culture is one of our strengths as people. But it is also a disadvantage as we tend to mix things up because we are usually patient.” These are the striking words quoted from Engineer Dado Banatao during the ‘3rd Go Negosyo Filipino Technopreneurship Summit’ held last February 19 at the SMX Convention Center in Pasay City. Dubbed as the ‘Filipino Bill Gates,’ Banatao is also considered as the ‘Father of the Semi-conductor.’ He is one of the greatest prides of Filipinos because of his significant contribution to the world of IT. As one of the peers of Microsoft Corp founder Bill Gates, he is also no less a billionaire visionary who is currently based in Silicon Valley. One of the popular technologies he ‘consumerized’ is GPS. In his view, aside from culture, another weakness of local entrepreneurs is their lack of necessary knowledge and skills to succeed. He thinks that our educational system is not enough to equip students to ‘conquer’ the world. He particularly identified inadequacies in the fields of science and engineering. “In almost 2,000 colleges and universities across the country, only 7% of the faculty members have PhD,” he revealed. He added that of those with the right credentials, some are not even productive enough because of limited opportunities for research. Banatao also feels sorry that in his observation, most segments of the government don’t believe in the importance of research and development. By that, he reiterated that the negative side of our being patient makes us feel contented and laid back that we tend to avoid pushing government agencies to do what they have to do. Of course, Banatao, who is known for his excellence in science and mathematics during his academic years, pointed out that the Philippines is lagging behind other countries in terms of proficiency of students in those subjects. 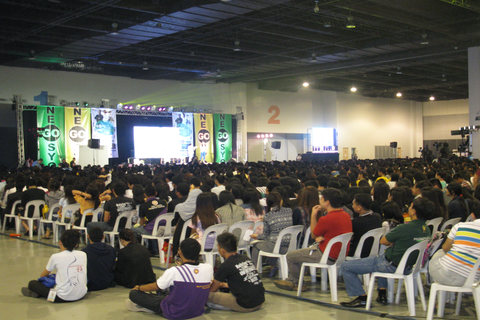 The event was a perfect time for Banatao to reach out to Filipino students. More than half of the audience in the symposium comprised of high school and college students from in and around Metro Manila. He advised them to study harder and to like the process of learning especially in the areas of science and math. This may lead them to become good ‘technopreneurs’ who are full of promising and innovative business ideas to make a difference in the future. 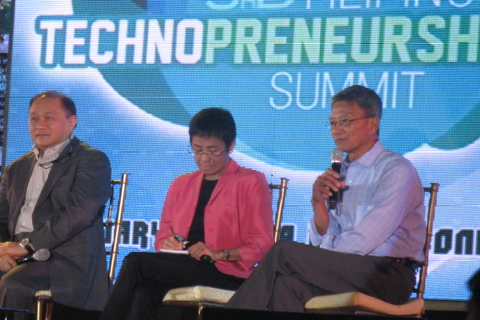 Upper photograph shows Engineer Dado Banatao (extreme right) with (from left) fellow speaker Manny V. Pangilinan--PLDT Group chairman--and event moderator Maria Ressa of Rappler.com.